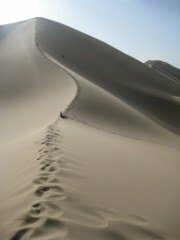 This page is about domestic flights in Mongolia, click here for info on international flights. 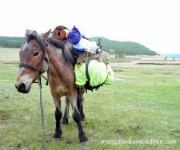 Click Here for my page listing airports and airlines in Mongolia. Click here for a list of the latest on domestic schedules for Mongolia flights, from EZnis and Aero Mongolia [Downloads a compressed Excel file. Why? Because I wasted 2 hours trying to get it to load as a web page; evidently it's beyond my limited technical abilities]. 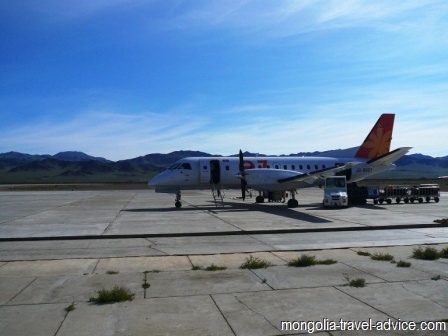 Domestic flights in Mongolia are reasonably priced, considering the vast distances. Airlines offer more domestic flights in summer, while winter timetables are restricted. There is far more demand in summer, and flights tend to cost more. A return flight to the further airports (such as Olgii) can be up to $900(!) in summer. Moron is about half that much. Tickets are cheaper for Mongolians that for foreigners. Ensure you take a student card if you have one, as you can get up to 20% off the normal price. Volunteers should also bring some relevant documentation when booking flights, as Peace Corps, etc. can fly at local's prices. In mid-summer (July/ August), the added demand for flights from tourists sees many flights sold out. Last time we flew to Olgii, my wife and I had schedule a flight 9 days(!) later than we'd wanted, in order to get a ticket. It's essential to book ahead if you want to take a flight during this period. The airlines have attempted to provide online ticketing facilities from 2009, but three years later they still don't work. This presents some difficulties, because domestic companies will not sell Mongolia flights to foreigners located outside Mongolia. Thankfully for you, dear reader, Bek Travel has a Ulaanbataar-based domestic flight ticketing service. They'll take a small commission on the ticket price, which will reasonably pay for their efforts, but it's worth the money to ensure you get your flight on the day you want it. Use the form below to request a quote from Bek Travel. EZnis offer larger planes for charter, which would be great if you're in a big group, but too much for most travelers. Blue Sky Aviation in Ulan Bator offers smaller Cessna planes for charter, which can land just about anywhere there's a grass strip runway.